At the very same moment in time that Firefox celebrates its 5th birthday, Firefox has also surpassed 25% worldwide market share for the very first time. This news comes from Net Applications’ report for the week of November 1st (their weekly data requires a subscription). 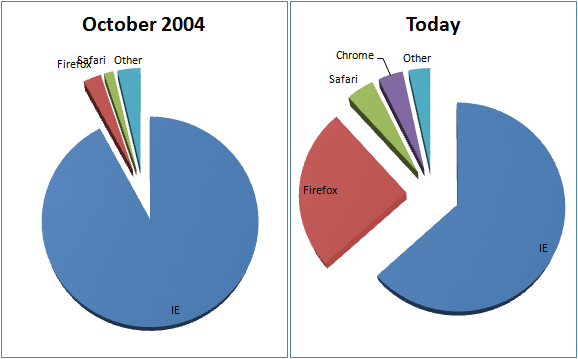 For those interested in “before and after” pictures, below is one way to visualize the browser market share landscape (based on Net Applications’ data). Wow, I like those pie charts! Man, those charts sure say a lot about the way we were. Thanks for freeing us Mozilla. I take it the Firefox share from time 0 actually means Gecko and/or Mozilla proper? Or are non-Firefox Gecko browsers in the “Other” category? Wow! We’ve made quite a dent, haven’t we, in the quasi-monopoly of five years ago! Let’s hope SeaMonkey will soon emerge out of the “Other” category and help its big brother increase the “Mozilla & Co.” market share even more. while my installed FF always crashes lol. Wow. Nice charts, and IE still stinks. Firefox may still have bugs and does not pass the acid test 3… But it sure Beats IE by a longshot. What would be a funny thing is the default browser gives options to keep it as default or allow to download from a list of other browsers available. Mozilla, Happy Birthday !!!! you have done wonders for a 5 year old. Keep chipping on the edges of the Pie chart and send IE out of existence in a few years !!!! !